Today we got some great clips of the action. In this first clip Theodore the Great Dane is tearing it up with Oliver the Bernese Mountain Dog and English Crème-colored Golden Retriever mix. This next clip stars Jack McCoy the Boxer and German Shepherd mix and Tucker the Doberman. Videos for National Dog Day 2014 There are some real gems here! Here is The World's Fasted Dog on two paws Hot Dog lol! Just a heads up folks, a Tacoma burglar is using a fake sob story about a lost dog to case homes. A dog worth $40,000... Yup, there sure is. Dog's weight is a hefty matter Slow down, switch, or stop those treats if this applies to your canine. There are several other ways to "treat", exercise being one of them! Dogs affected by kids going back to school I don't agree with everything in this article... Specifically the parts about making your departure a "happy time"... I could see that back firing, and exacerbating the situation. I also don't agree with the, "if things don't improve take them to the vet" portion of the article, that isn't going to get you anywhere and will just end up costing you money... Unless of course you want to "drug up" you pooch. Which we aren't opposed to, for at home use in extreme cases. However it is certainly not an everyday solution, and is merely a Band-Aid on the problem. If this applies to your canine, start by reading my multi-part article on Separation Anxiety found here. From today's ruckus rolls... All kinds of fun! In the Big Roll, we had "Ollie" being the usual clown with his buddy Jasper. Theodore had a great time, along with Brix, Jackson, Gage, and many others. From the Medium Roll, we have a nice clip of "Bogart" and Yuki running amok. Upstairs in the Little Roll Play area, Miguel, got the whole pack to party down... She also has a couple of "boyfriends" in Buckwheat and Rusty lol! Last Friday (the 22nd), Fort Fido welcomed a fresh and clean "facelift" to our door. Fort Fido has been needing a "facelift" such as this. However, the door painting is just the beginning. Along the side we had a beautification of the beauty bark and potty posts. Once the green paint arrives and we finish the front, we'll be off to the next project. What could it be? Stay tuned to find out! Meet Jackson, the newest addition to the Fort Fido pack. 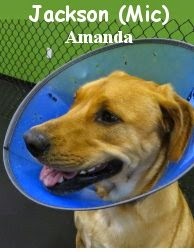 Jackson is a 2 year old, 80 pound, Lab Mix. 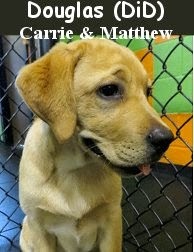 He came in for his assessment this morning full of energy and ready to play. He hung out with the large dogs and had a blast. Good job today Jackson! We hope to see you again soon. Here is a clip of Jackson playing with Reilly the Doberman. If you've been on the internet this past week, you have probably seen videos of people dumping ice water over their heads to raise money for ALS research. Now dogs have started taking the challenge. Here are 10 Dogs That Bravely Completed the Ice Bucket Challenge. A woman braved rush-hour traffic, to rescue a dog wandering a Southern California freeway. Your dog can now join you for dinner under new California legislation. Feast your eyes on Espresso, otherwise known as "Espy" for short. She is a one year old, seventy-five pound, Chocolate Labrador Retriever. 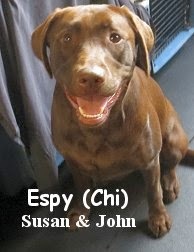 Espy came into Fort Fido this morning all fired up, very excited for her Assessment Day. We marched her straight to the Big Roll, where she got down to business right away. A Dog Daycare regular, Espy was enthralled by meeting and greeting the pack...Within minutes, she was playing fast and furiously with none other than Oliver and Theodore, two staples of our large dog play area. The three dogs hit it off beautifully, and Espy, continued to thrive here throughout the day. This veteran canine-socializer should prove to be a nice addition to our pack. Way to go girl, you are welcome at The Fort anytime. We'll see ya soon! In other news, for quite some time now we have been selling Fromm Gold Adult Dog Food and Cat Food. It has also become our "house food" for Overnight Boarding. The move to Fromm, which happened over a year ago, has proven to be an excellent change. All of our dogs (Gibson, Cortez, Marco Polo) eat it, and several of our Daycare and Boarding Dogs eat it as well... Not only do they "eat it", they really thrive on it, by having healthy energy levels, solid stools and good looking coats. We carry their high-quality canned food as well. What makes people look like their pets? Early this morn we met up with Penney for her assessment. 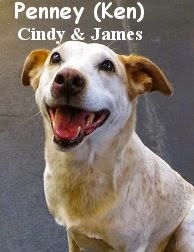 She is a sweet, nine year old, thirty-five pound, Australian Cattle Dog. As of late, Penney, has been going through quite a few changes. Her best friend, a beagle in the same family, recently passed and she is moving across town. Despite these changes, Penney is doing quite well, she is here at The Fort to relax and enjoy the company of other canines. We had Penney try out our Medium Roll... Given her size, age, and kindly personality, we thought it the perfect fit for her. In the play area, Penney explored a little bit and greeted the other pack members. She stayed incredibly calm and balanced the whole time, even though she didn't get to playing too much. There were many young whippersnappers in today's Medium Roll, and Penney handled their energy well. She was more content just strolling about and hanging out, which is totally ok, and can be good for a first visit. At any rate, welcome to Fort Fido Penney, swell job today! Hopefully we'll see you again, and maybe even see a bit more action out of you. I thought some of you would get a chuckle out of these two BuzzFeed funnies I've been saving. The first one is 19 Ways Having A Dog Will Prepare You For Kids. The second one is a video I found quite hilarious, which came from BuzzFeed and College Humor... I will say that it's a wee bit cheeky, you've been warned lol. Here's a quick clip from this morning of Theodore the Great Dane tearing it up with Reilly the Doberman. A brave little girl survived 11 days lost in the forests of Siberia, guarded by her trusty dog that finally left his post and summoned rescuers. Dreams do come true -- even for canines. This week, a 7-year-old dog named Duke was elected mayor of Cormorant, a small town in Minnesota. Here's a great one from the Little Roll, it seems to always be a party up there! In the clip, you can spot Dixie, Pearl, Willow, Mimi and Pippin. The next two are just some quickies of Diego, Penny and Reilly having some fun. Up for his assessment early this morning was Max. 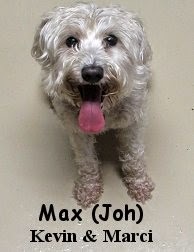 He is a sprightly, seven year old, twenty-three pound, Schnoodle (Schnauzer and Poodle Mix). Quickly scanning the room, Max entered The Fort's Little Roll play area with wonder and excitement. He met with the other dogs gregariously, and many of them liked him right away. Max is no stranger to socializing and play. He is a a livewire, ready and raring to play hard, yet he's gentle enough to know when another dog doesn't want to play. His canine communication skills are quite good. Due to his size and play-style, Max is flexible enough to do well in our Small or Medium Roll. This wily but kind fella, is welcome to attend Fort Fido anytime. We look forward to his return. First rate job today Maxwell! It sure is fun when a new dog gets into play so quickly, Max was in the thick of it, minutes after his arrival. It shows that he is pretty darn "calm and balanced", and comfortable here. Awesome! Here he is sprinting around with Sheltie-man Gibson. This morning we welcomed Molly to the Fort. Molly is a 9 month old, 9 pound, black and white Chihuahua/Dachshund mix. She found her forever home last weekend at Woofstock, the annual pet adoption and music festival held at the University of Puget Sound. She had a great first day mingling with the small pack upstairs. You did a great job today Molly! You are welcome back anytime. We hope to see you soon. Cortez greeted her this morning, and they really hit if off. Here is a clip of Cortez showing her the ropes. Claire just won our awesome Fort Fido Basket, packed with dog goodies! We raffled it off at last weekend's Woofstock pet adoption event. Claire and her folks have a Lab at home, and I'm sure he'll love all of the stuff they just scored. Way to go Claire! We were pleased to meet up with the infamous Dinero and Ollie, in for their assessments this morning. This dapper duo, proved to be a great addition to Fort Fido's Little Roll. 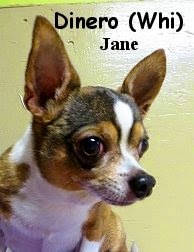 Dinero is a handsome, eleven year old, ten pound, Chihuahua. 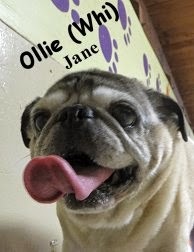 Ollie is a regal, thirteen year old, twenty-nine pound, Pug. Both Dinero and Ollie did well upstairs in our small dog play area. They seemed to enjoy the company of the other canines, and it's clear that they've met a dog or two in their days. For older, more mature fellas, Dinero and Ollie truly handled themselves well, even amongst the young pups of the pack. Although they didn't do much in the way of playing, they did socialize, meeting and greeting other dogs, while walking and sniffing about curiously. 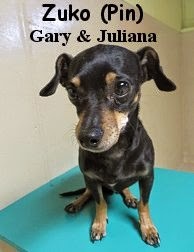 These guys enjoyed the socializing and are ready to meet more pups and make new friends. Dinero and Ollie are very nice dogs that fit in well here at The Fort. We look forward to their return. The Fort Fido crew had some fun and a workout this morning, because of our latest recruit. Meet Douglas, he is a head-turning, high-energy, three month old, thirty pound, Yellow Labrador Retriever that came in for his assessment. He's the type of pup that you'd see on one of those primetime dog food commercials... You know, the ones where a big-cute-puppy knocks over a huge bag of kibble and starts devouring it... That's Douglas hahaha! After being introduced to the "Medium Roll", where we are sure he won't stay for too long because the "Big Roll" is beckoning him, Douglas met up with Fort regular Louis. The two hit it off quickly and easily, with Louis being quite playful and patient with the young canine. As time passed and the pack grew Douglas stayed in a blissful state, AKA, he was in Dog Heaven haha. Being a puppy, Douglas is here to learn how to socialize and interact with other canines properly. So far, he's on the right track. We are almost certain that, given time and consistency, Douglas and his owners can get a whole lot out of Dog Daycare. Nice job today Douglas, you're welcome back anytime! Woofstock 2014 was a great success for shelter/rescue animals and all who attended. 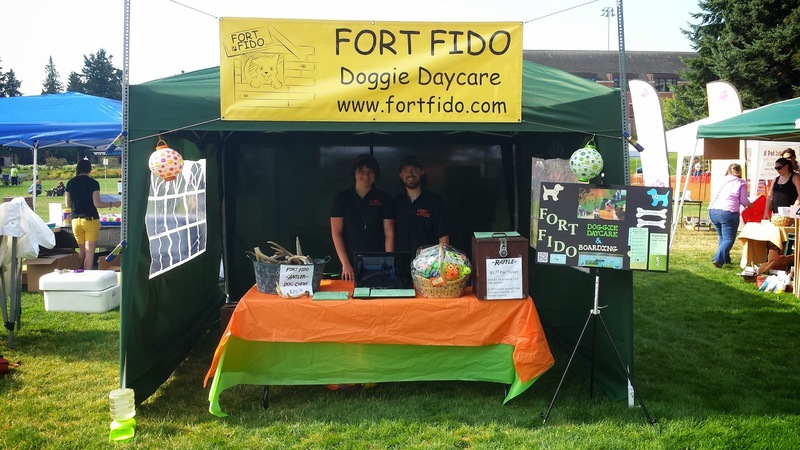 We had a nice time, and raffled off another Fort Fido basket, congrats to the winner! It rained for a little bit during setup, but after that it was sunny and hot. Thanks to all that checked out our booth and said hello, we really appreciated it! This year, by the end of the day, Woofstock had 110 adoptions happen and about 2,500 visitors. Way to go! P.S. Our next Doggy Event looks to be Harbor Hounds, in Gig Harbor, in September. Susan won this great Fort Fido basket, packed full of dog goodies, at last weekends Dog-A-Thon. Join us at Woofstock this Saturday, August 2nd from 10am - 3pm, for your chance to win a basket. Woofstock is a fun pet adoption & live music festival, and will be held at the University of Puget Sound Todd Field. Raffle tickets are $1 each, and can be purchased at the Fort Fido booth, all proceeds from the raffle will go to the Pierce County Humane Society. We hope to see you there.